The Appear TV bulk descrambler can decrypt up to 250 services, with oridering options from 25 to 250 simultaneous streams of descrambling. Appear TV descrambler packs a high efficiency multi channel unit in to a single module width. 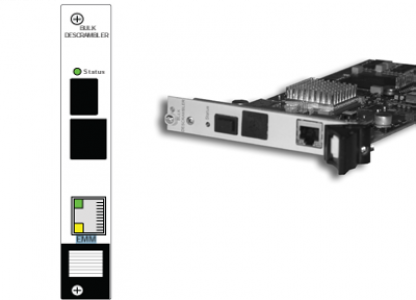 Combined with a range of module from the range, complex broadcast and rebroadcast systems can be created, ideal for use in Satellite, terrestrial, and cable head ends. With support for various CA systems, be it hardware-based or software-based, Appear TV’s descramblers are an efficient, space and energy saving solution. Resilience is built into the Appear TV architecture. All modules are hot-swappable, including power supplies and fans. Pro MPEG FEC support is optional, and Appear TV’s redundancy solution offers full or partial redundancy for a variety of failure scenarios.